After over six decades of searching, scientists have finally confirmed the existence of dust cloud satellites around the Earth. Since the 19th century, scientists have been looking for a second moon of the Earth. Over the years, there have been multiple claims and sightings of additional satellites of the Earth. In the 1960s, John Bargby claimed to have spotted as many as ten previously undiscovered satellites of the Earth. These claims were never confirmed. Before going any further, we need to understand a tiny slice of celestial mechanics. A pair of bodies, such as the Sun-Earth system, or the Earth-Moon system, have five special points in space around them. The combined gravitational influence of the Earth and the Sun, keep any objects located in points, in the same relative position. Essentially, anything that finds its way to these points, tend to remain there. These positions are called Lagrangian points, and a system of any two bodies has five of them, labeled L1, L2, L3, L4 and L5. 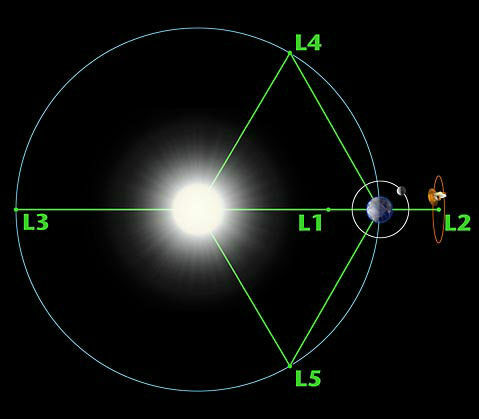 In the Earth-Moon system, the L4 and L5 points are not entirely stable, and are constantly shifting slightly, because of the gravitational pull of the Sun. Objects in these points may be under the gravitational influence of other planets as well. However, any objects at these locations would be ideal to find any additional satellites of the Earth. In the 1950s, Polish astronomer Kazimierz Kordylewski began a search for “Trojan” satellites of the Earth. The L4 and L5 points are together known as the Trojan points, and a number of other planets have satellites here. Jupiter has more than 6,000 Trojan satellites. There are seventeen Neptunian trojans identified, and four Martian Trojans. There are a number of Trojan moons in the Saturnian system. In the 1950s, Kordylewski started looking for Earth Trojans. In 1956, Kordylewski spotted a faint, diffuse patch of light at one of the Trojan points, with his naked eye. This was indicative of a cloud of dust. Almost five years later, Kordylewski managed to capture the dust cloud on film. In 1966, astronomers reported seeing two faint patches at both the L4 and L5 points while flying on board a NASA plane. In 1975, the Orbiting Solar Observatory Announced the discovery of what were then called Kordylewski Dust Clouds, after a 15 month long observation campaign. The faint dust clouds were subsequently photographed, but the cloud satellites remained elusive. Then there were a number of observation campaigns where astronomers specifically looked at these points and found nothing. In 2009, the Japanese Hiten probe flew through the area, and could not find any particles that were larger or more densely together than the norm. In all, since their original discovery by Kordylewski in the 1960s, there have been various contradictory reports of the existence of the dust cloud satellites. The very existence of the dust clouds were controversial, and as such, not widely accepted – so far. Now, a team of Hungarian astronomers and physicists have found evidence of these elusive dust cloud satellites. First the team used computer models to figure out where exactly the dust clouds would be located, and what their properties could be. The simulations were also used to assess how the KDCs could be detected. The idea was to use polarised filters on telescopes, similar to the sunglasses that we use. When using the approach on the L5 point, the researchers found exactly what they were looking for – a diffuse cloud of tiny particles. The dust cloud extended even beyond the field of view of the lense. The team ruled out other explanations of things that could cause these dust clouds to show up in the photographs – including optical artefacts, faint clouds in the skies of the Earth, and condensation trails of aircraft. Various aspects of the photographs were used to eliminate these alternative explanations one by one, thus confirming that the Earth had a moon made of dust. The new research is going to appear in the Monthly Notices of the Royal Astronomical Society. There are many reasons why photographing the KDCs have proved to be very difficult. There is light from other stars, the light from galaxies, sunlight reflecting from particles suspended along the plane of the solar system (known as zodiacal light) and the diffuse luminance of the night sky itself. Another problem is the light pollution from the artificial night lights used by humans, and dumping of aerosols into the atmosphere aggravates the problem. All of this light makes photographing diffuse particles of dust, 400,000 kilometres away, extremely difficult. The dust cloud satellites appear only slightly marginally brighter than their surroundings. Additionally, the KDCs may be transient – they may not be permanent fixtures in the sky. According to the simulations, the structure and density of the dust moons are not a constant. They are in a constant change of flux, and the dust moons keeps changing shape. It is a swirling mass of particles with a constantly changing shape. Another problem is that the dust cloud is an area of higher particle density than the particles suspended in the Zodiacal plane – roughly coinciding with the plane of the Solar System. However, the Hungarian team has demonstrated that the density of the dust particles at the Lagrange points, are greater than the density of the particles in the Zodiacal plane. 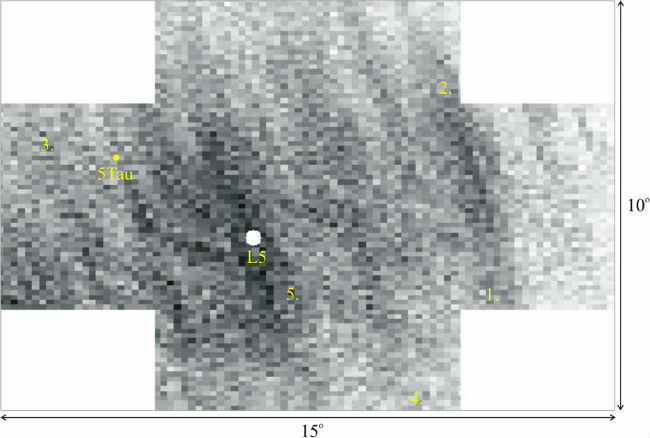 Additionally, the finding also shows that these dust clouds can be observed by Earth based instruments, with the right equipment and under the right conditions. The stability of the Lagrangian points make them prime candidates for building up future space based resources. It makes good sense to part observatories and instruments at these points because they have several ideal characteristics. They offer uninterrupted communications the Earth (as they are always in a fixed point), and can observe some targets, such as the Sun, uninterrupted. The Solar and Heliospheric Observatory (SOHO) and the Advanced Composition Explorer (ACE) are both located at L1. The L4 and L5 points are considered to be good places to start off with human space colonies, and the idea was advocated by the L5 Society, which was later absorbed into the National Space Society. The points are considered ideal locations to point future generations of wide aperture telescopes – astronomical instruments so powerful that they can directly image the surfaces of exoplanets. They can also be a potential dumpyard in the sky for hazardous materials and pollutants. The researchers are assessing the Kordylewski clouds to make sure that the dust particles do not cause problems to any devices or equipment that may be dispatched to the Lagrangian points in the future.